Delhi High Court has released short hand & type test schedule of qualified candidates of written test which was conducted on 25th May 2014. The short hand type test will be conducted on 8th February 2015 (Sunday) from 9:00 AM to 4:00PM in six sets containing 60 candidates in each set. Admit cards/ call letters/hall tickets have been dispatched by posts to those candidates who had qualified written examination on the address which they mentioned in the application from at the time to apply for the posts. The list of qualified candidates in written exam has released along with short hand & typing schedule of individual candidate. In case any candidates displayed in the list would not receive admit card by 02nd February 2015, then candidate can collect duplicate admit card in any working day between 10:00 AM to 5:00 PM from official address i.e. Room No. 205, II Floor, Establishment-I Branch, Administrative Block, Delhi High Court, New Delhi on the account of producing Identity proof. · Save and print the Result Hard Copy for appearing in Short Hand & Typing Test. The DELHI HIGH COURT PA Exam was conducted on 25th May 2014. The DELHI HIGH COURT PA EXAM 2015 will be conducted by Pen MODE. Written Test comprised of one paper in English language in which question were given from Essay, Grammar and Translation. A Merit List was prepared based on the performance of candidates who qualified the exam. 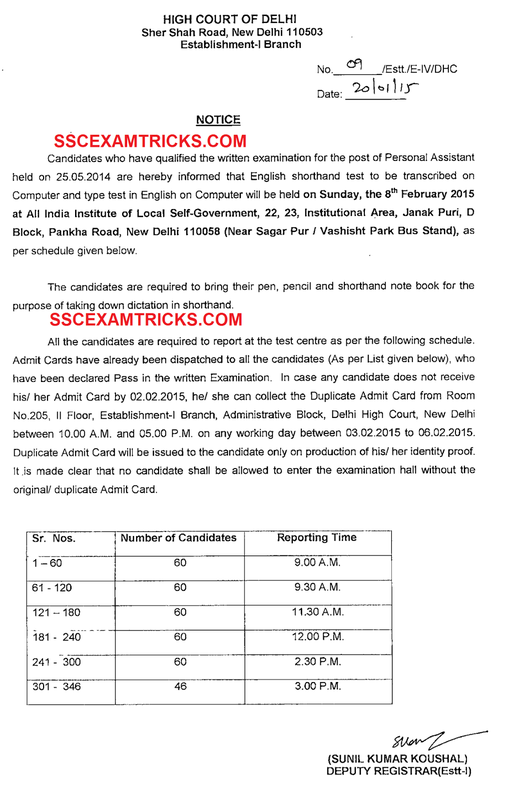 Then candidates are called for Short Hand & Typing Test which is scheduled on 08th February 2015. Candidates will be called for short hand typing test together/ simultaneously. Candidates will be given 5 minutes in which candidates will have to write at least 500 words in English so that short hand will be measured per minute i.e. 100 words per minutes. Then candidates will be given next 10 minutes to type an English Paragraph in word file (in MS Office) and total words will be counted and will be note down on individual performance sheet of the candidate. Then typing speed per minutes will be calculated with no. of errors/mistype/mistakes in percentage. The qualified candidates of Short hand & Typing Test /Selected candidates are required to bring computer generated online application, result print, original documents (10th, DMC, Cast certificate –If applicable etc.) and one set of self-attested of all the documents to the venue of . 10th Certificate is used for Age Proof. Candidate must bring at least one Address proof i.e. PAN Card, Ration Card, Aadhar Card, Voter card or Driving License. Candidates are advised to bring two extra colored recent passport size photograph (same as pasted on computer generated application form) required for application form or other document requirements. Candidate must bring Caste/PWD/EXS certificate to claim for seat available for reserve category. If the candidate is an employer of any organization then it is mandatory to bring original as well as photocopy of NOC (No Objection Certificate) with them. Final Merit List of Short Listed/ List of Finally Selected candidates will be released on the official website.